It is always a worry among the dog owners regarding the expenses of the canine foods. Especially during their growing period, they need adequate nutrients which keep them fit and functioning, just like us. If you hit the departmental stores, you can find a variety of dog foods that are rich in nutrients and also canine friendly. But, the price of those protein-rich biscuits or cookies may sometimes take a toll on your budget. So, are you searching for an easy way out and thinking what if you could share your own tasty meals with them? Why not? You no longer have to be troubled about those expensive dog foods for your canine friend. You can share some of those foods and vegetables that are easily available in your kitchen store. Just check out the list below, and you will be surprised to see what your pup might love and gorge on. Dogs just relish peanut butter with bread or other solid add-ons. Moreover, peanut butter has all the necessary nutrients in it. Whether it is protein, vitamin B complex or vitamin E, peanut butter can provide your dog with all that he needs. Make his breakfast with the bread and peanut butter and see how your doggy finishes the meal and want more. If you want him to stay busy with his toys, stuff them with some peanut butter. Chicken is one of dog’s favorite dishes. Chicken is enriched with high animal protein and no doubt your big Labrador or your little Pomeranian will surely eat this with watering mouth. If you want to add some extra protein and taste to your pet’s meal, just add some cooked chicken to its bowl with a little spice. Who does not know the nutritional value of salmon? This golden sea fish has all the good things that one needs for healthy living. Not just for humans, Salmon makes a great food for dogs, too. Yes, you can now share your favorite Su Shi with your pup. Adding some vegetables and a little spice can really make your dog lick the bowl clean. Dogs need a lot of protein while they grow up and the supplements available in the market are not always an affordable option. What to do then? The cheapest source of high protein is egg and dogs love it. So, if you scramble egg for your breakfast, keep it for your puppy too. Eggs can also be digested easily and make a healthy snack for your canine buddies. Giving your dog only protein will not suffice his needs. You also need to include adequate fibers to keep its digestive system strong and healthy. 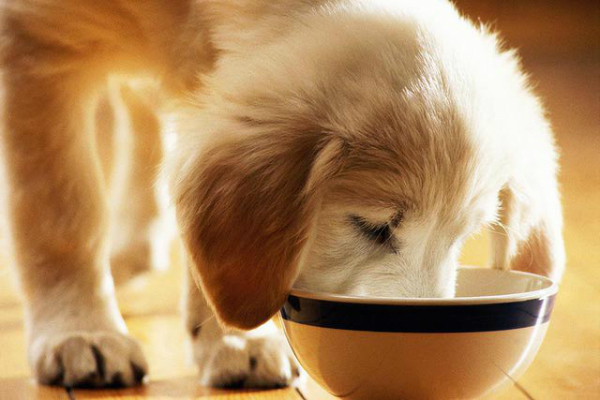 Oatmeal can be a great source of fiber which your dog will happily chomp on. Therefore, think of making some oatmeal when your dog needs a light snacking. Yogurt can be an alternative for milk when it comes to calcium. It helps to keep the bones strong. Yogurt also has health inducing bacteria which keep their digestive system functioning in the proper way, killing all the harmful microorganisms. No one can deny the health benefits of Apples. But not only you, but your dog too can enjoy those benefits. Just pluck out the seeds from the apples and slice it to make a healthy and tasty dish for your pup. It will supply him with the requisite fiber and vitamins like A and C that will strengthen his immunity. So, if you are running out of dog food (or budget for it), just include the abovementioned delicacies into his diet and stop fretting about his food habits.